Best Tribute Show/Act sponsored by Paul James Associates. Best Band/Duo sponsored by Grandee O'Donnells. Best Comedy Show/Act sponsored by the Flight Center. Best Variety/Most Original Show sponsored by Paul James Associates. Avril Taylor - withdrew from competition. There are 2 categories being voted for on the day of the ceremony: Best Male and Best Female singer. The nominees will be performing live on the day for your votes. These 2 categories are being voted for by the entertainers only. Will be decided by an independent panel of judges. Sunday 21st May at 2pm, Pleasure Island, Playa de las Americas. The Awards ceremony will be hosted by Nathan Swift. To ensure fair play you will only be able to vote by text, any duplicated votes will be discounted, thanks to modern technology. Freedom of information means that voting data will be available to be viewed following the event to ensure that the terms of fair play have been adhered to. Please note that any artist from the Best Male Singer or Best Female Singer categories that fails to perform on the day, will not be eligible for the award. The managements decision is final regarding any aspect of the Tenerife Entertainment Awards. 2pm Awards Ceremony, Pleasure Island, Playa de las Americas, hosted by Nathan Swift, being broadcast live on Oasis Fm. 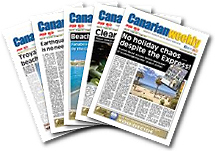 Interview with Chris Elkington, Managing Director of EmCan Media, incorporating Oasis Fm, Canarian Weekly and HFM Ibiza. Q. How did The Entertainment Awards come about? A. The idea was born out of a brain storm. At the turn of the year the morale of the island was quite low, the island appeared quiet, the weather was not great and venues had just received changes to the smoking laws. As a company we looked at what we could do with different events, competition, promotions etc throughout the year. Now one of these ideas was to launch The Entertainment Awards, as the island has changed a lot with new acts and venues since the last David Alexander Awards some years ago. Having myself been involved in the David Alexander Awards I felt if we did it then we needed to include Craig, who writes the entertainment page for Canarian Weekly, as part of the team and more importantly a different voting system than previous awards to ensure fairness. Q. Is it not quite contentious that there is category for best radio DJ and yet it is being jointly run by Oasis Fm? A. No, on the contrary. This category is open to all Radio DJ’S, whether they broadcast on Power Fm, Gold Fm or indeed Oasis Fm. The only stipulation is that the DJ has to be Tenerife based. Q. Many sceptics would say that the voting which begins on Friday 21st April is open to abuse, what would your response to that be? A: Of course, some people will think that but voting by text is simple. Our SMS system will accept as many texts as you wish to send and a proportion of that money goes to charity. However, the beauty of the technology means that only one will be counted, we are able to eliminate duplication. All voting data will be available following the event if anyone wishes to view it. It’s key if the awards are to have credibility that the voting is not manipulated and fair. Q. What will the event itself be like? A. The Tenerife Entertainment Awards are taking place at Pleasure Island, 21st May 2pm and will be hosted by Nathan Swift. We chose Nathan as host as he is well known on the island, but, no longer lives here so he’s neutral. The event itself will be spectacular due to the volume of production work being put into it. It is also a possibility that The Entertainment Awards will be broadcast live on television - watch this space! Q. Now there are two categories that can’t be voted for until the day, how will that work? A. There are two categories - Best Male Singer and Best Female Singer, the nominees will perform live at the event and then votes will be cast by the audience and listeners to the radio and on-line for their favourite. Q. What other events are Oasis Fm and Canarian Weekly arranging this year? A. We have a whole host of things coming up later in the year some I can share with you and others are so exciting that they are being kept under wraps for now. As well as Ministry of Sound will be working with HED KANDI broadcasting at the weekends and at Christmas we will have a special event for schools and children, details will be released nearer the date. Q. What would your comments be to those who think The Entertainment Awards are just a ‘flash in the pan’ and not worth supporting? A. Potentially it’s one of the largest events that Oasis Fm and Canarian Weekly have organised as it will be a regular event, but it needs the support of not only the general public nominating and now voting for a winner but those from the industry themselves. We would hope that The Entertainment Awards are fully supported by both the entertainers and venues alike as it’s for them and it will be a bi- annual event.